Continuing our little May video series, let's look at a couple of episodes from the long-running G.E. College Bowl. As usual, following the clips we'll have a few observations. The first is from March 29, 1959, when the series ran on CBS and was hosted by Allen Ludden. The contest pits Barnard College of New York City versus the University of Southern California. Enjoy the commercials! The second match is later, from March 9, 1966. The show has moved from CBS to NBC, from black and white to color, and from Alan Ludden as host to Robert Earle. Our competitors this time are Princeton University and tiny Agnes Scott College in Decatur, Georgia. The show is divided into three parts; parts two and three can be seen here and here. As one might expect, there's more to see here than a simple nostalgia for old television. From the purely technical side, the later show is, as you would expect, a more polished and compelling production. * The addition of color makes the graphics pop, and the repeated focus on the clock, with the sweep second hand approaching zero, enhances the sense of urgency and drama in the cliffhanger ending. *Understandable, since the 1959 game was only the show's tenth telecast. 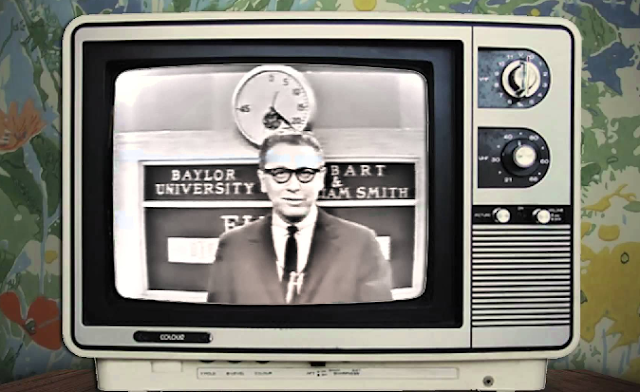 Robert Earle was a far more compelling choice as host than the somewhat smarmy Ludden, who just can't resist calling attention to himself in the best tradition of game show hosts. * Earle never lets his role detract from that of the students, and unlike Ludden seems far more at ease with the academic nature of the questions. One gets the idea that Earle might have been able to answer a few of the questions himself, whereas Ludden comes across as more condescending, reminding you that he's the host, whether he knows the answers or not. *Rather like the difference between Bill Cullen and, say, Richard Dawson. *In fact, this spawns an entirely new question: the role of a college education in modern society. In an era when college degrees seem to be a requirement for all but the most menial jobs, with advanced degrees often preferred, have we gotten away from the original intent of higher education? Should we revisit the difference between a vocational college and one specializing in liberal arts? Do we put too much of a premium on college degrees, with the result a milieu of entitlement, debt and political indoctrination? Interesting questions all, ones that can easily be considered in the context of television's portrayal through the years, from a program like College Bowl to series such as Halls of Ivy, Hank and The Paper Chase. Furthermore, the eternal struggle over college has always been a staple of family dramas and sitcoms, particularly in the mid-part of the century, when so many first generation Americans were under pressure to become the first in their family to attend college. At that point it was a mark not only of achievement but assimilation into the American way. Even then the tension existed between parents who wanted their children to do better than they did, to get that degree and then become a professional, a doctor or a lawyer, and children who wanted to follow their hearts and be a mechanic, a singer or an actress; in later years, we'd see those same children rebel against the system and become dropouts, peace activists, or non-profit advocates, much to the consternation of their parents. And except in the most frothy comedies, college is often portrayed as a struggle of pressure to achieve, measured against either the expectations of others or the student's own expectation. In the end, do we perhaps see in television's portrayal of higher education an evolution in the depiction of college life, as the quest for knowledge becomes, instead, the quest for a better, higher-paying and more prestigious job? Alas, probably a topic for another day. And look at the students on College Bowl; my wife commented on how mature and poised they were, particularly the girls of Barnard. Cherry White*, for example, has a lot more moxie than people I've seen in the business world. Nerdish overtones, of course, but still very polished for college students. Even in 1966, when knowledge was becoming a weapon that students would use against the establishment, there's still something clean-cut and adult about the players. I remember my wife commenting, as we watched the episode, on whether or not any of them wound up involved in campus riots or antiwar protests. The point is, would young people today be as poised, as adult, in a culture that seems to adore perpetual adolescence? Would they look as if they were headed for success, a cocktail party, or back to their parents' basements? *Whose actual first name, by the way, was "Heritage." I wonder what ever happened to her? According to one source, General Electric dropped their sponsorship of College Bowl due to that very college unrest, after which the show disappeared from weekly airwaves. If that's true then it's a sure a sign as any of the cultural upheavals enveloping the country, and a reminder of how that manifests itself on television.